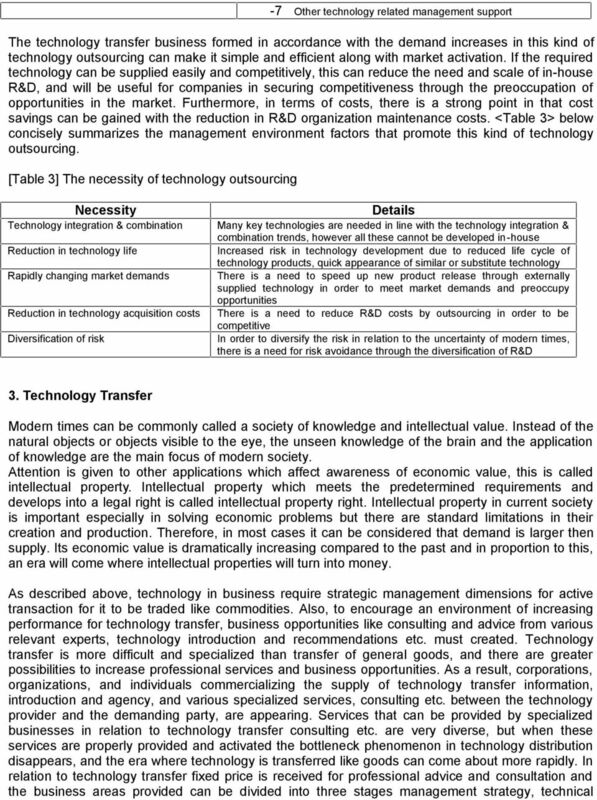 Download "Technology Transfer Principle & Strategy"
5 [Table 5] Characteristics of intellectual property -Not visible and does not have physical form Characteristics of intellectual property - Recovery value is relatively high because of the limitations in creation and production due to the high level intellectual origin -Evaluation and valuation is very difficult, and transfer price and conditions are decided through negotiation rather than by the market. -Exclusive with announced conditions, exclusive legal right is possible - Time and money consumption during initial creation, development, and production is high, but costs involved in duplication & reproduction for use and distribution is low enough to be negligible - Life cycle is relatively short, value fluctuation is severe 2. 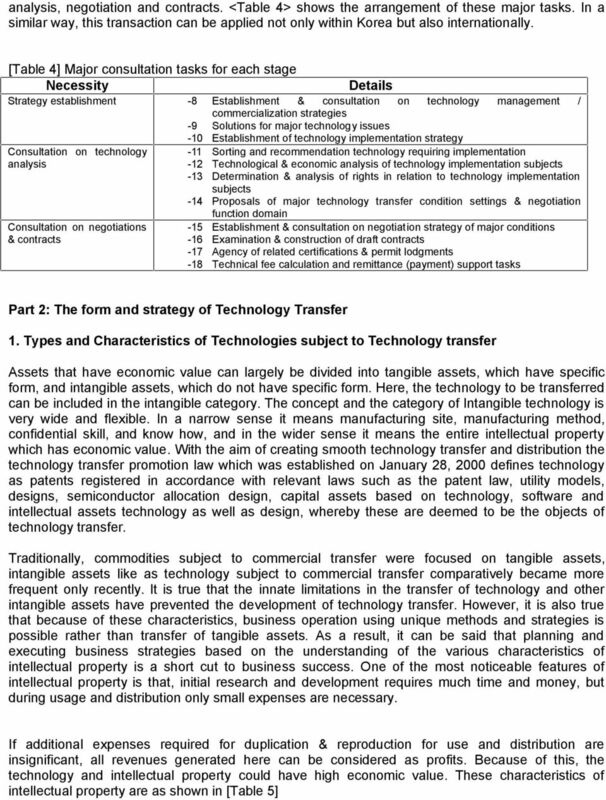 Methods of Technology Transfer (1) Method of technology sale or transfer Technology transfer & acquisition is the transfer of rights in accordance with a contract, and of these a transfer for a consideration is the called the sale of technology. By the sale of the relevant technology, comprehensive control and management is handed over to the buyer who pays the price (sales price). 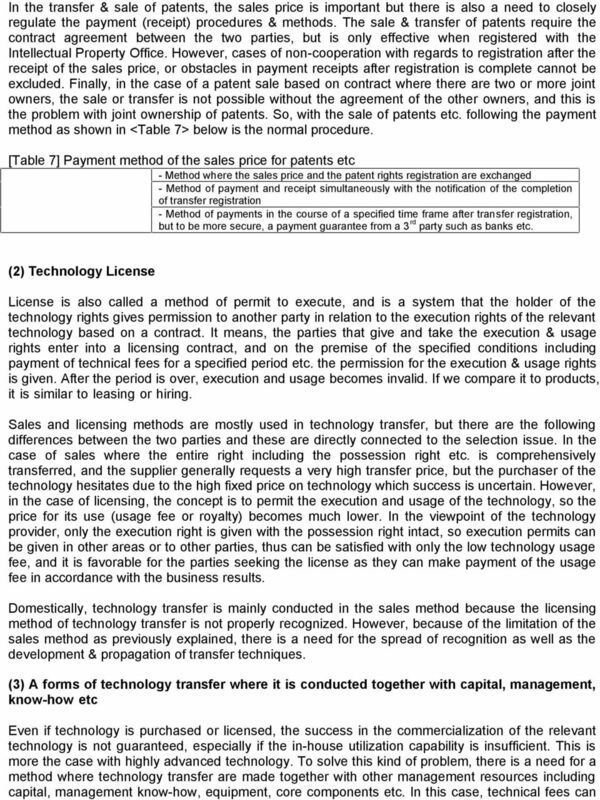 Besides the difficulty in working out the value and the process of patent registration, this is similar to product sales. Not just the already registered patents but also the sale of patents in application can become the subject of a transfer (simply by recording patent application number). 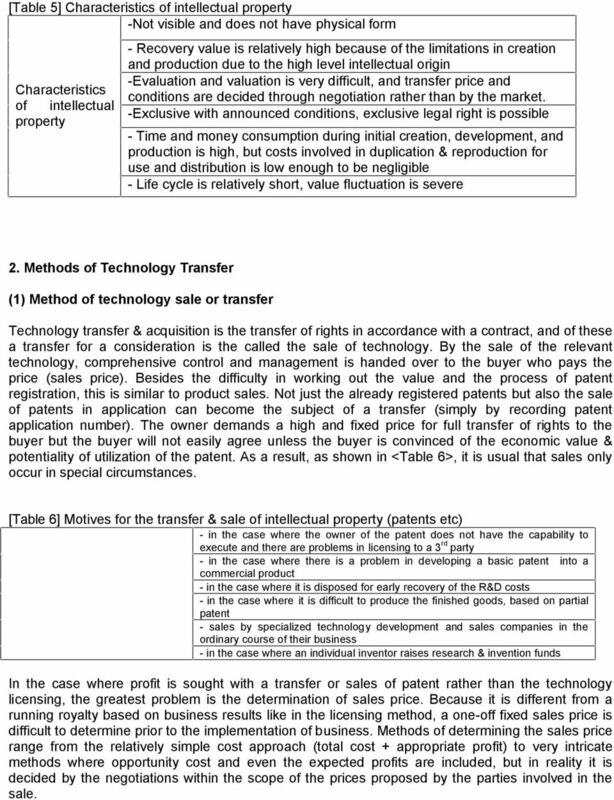 The owner demands a high and fixed price for full transfer of rights to the buyer but the buyer will not easily agree unless the buyer is convinced of the economic value & potentiality of utilization of the patent. As a result, as shown in <Table 6>, it is usual that sales only occur in special circumstances. 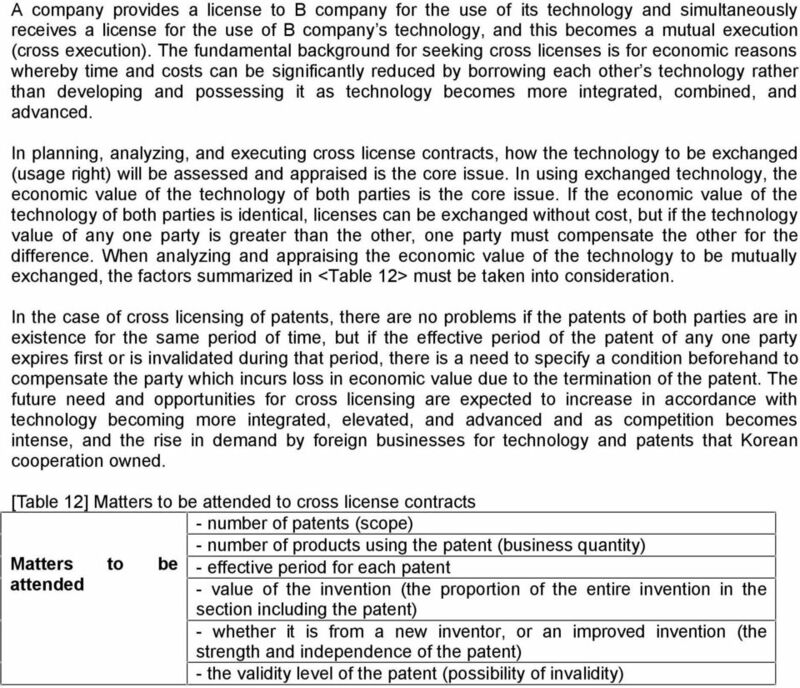 [Table 6] Motives for the transfer & sale of intellectual property (patents etc) - in the case where the owner of the patent does not have the capability to execute and there are problems in licensing to a 3 rd party - in the case where there is a problem in developing a basic patent into a commercial product - in the case where it is disposed for early recovery of the R&D costs - in the case where it is difficult to produce the finished goods, based on partial patent - sales by specialized technology development and sales companies in the ordinary course of their business - in the case where an individual inventor raises research & invention funds In the case where profit is sought with a transfer or sales of patent rather than the technology licensing, the greatest problem is the determination of sales price. Because it is different from a running royalty based on business results like in the licensing method, a one-off fixed sales price is difficult to determine prior to the implementation of business. Methods of determining the sales price range from the relatively simple cost approach (total cost + appropriate profit) to very intricate methods where opportunity cost and even the expected profits are included, but in reality it is decided by the negotiations within the scope of the prices proposed by the parties involved in the sale. 8 2>, and the characteristics of each stage can be summarized as shown in <Table 8>. 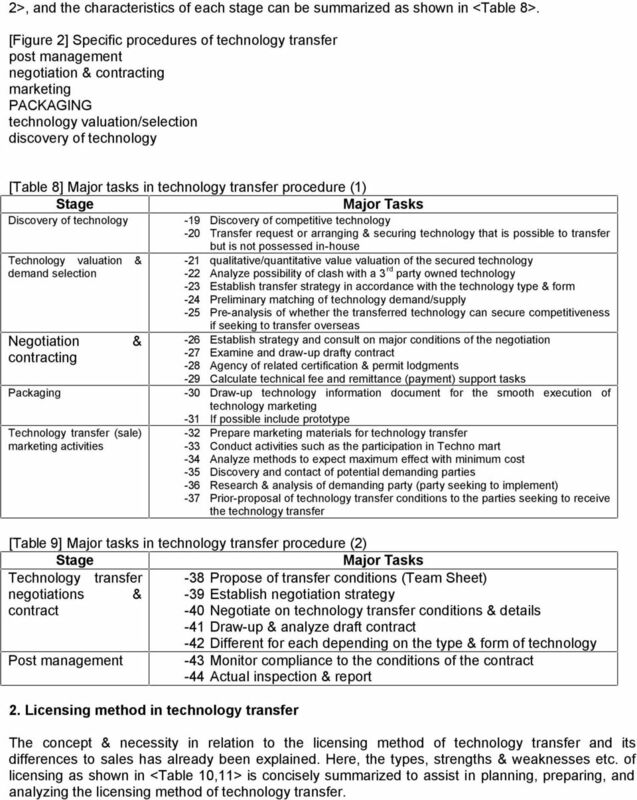 [Figure 2] Specific procedures of technology transfer post management negotiation & contracting marketing PACKAGING technology valuation/selection discovery of technology [Table 8] Major tasks in technology transfer procedure (1) Stage Major Tasks Discovery of technology Technology valuation & demand selection Negotiation contracting Packaging & Technology transfer (sale) marketing activities -19 Discovery of competitive technology -20 Transfer request or arranging & securing technology that is possible to transfer but is not possessed in-house -21 qualitative/quantitative value valuation of the secured technology -22 Analyze possibility of clash with a 3 rd party owned technology -23 Establish transfer strategy in accordance with the technology type & form -24 Preliminary matching of technology demand/supply -25 Pre-analysis of whether the transferred technology can secure competitiveness if seeking to transfer overseas -26 Establish strategy and consult on major conditions of the negotiation -27 Examine and draw-up drafty contract -28 Agency of related certification & permit lodgments -29 Calculate technical fee and remittance (payment) support tasks -30 Draw-up technology information document for the smooth execution of technology marketing -31 If possible include prototype -32 Prepare marketing materials for technology transfer -33 Conduct activities such as the participation in Techno mart -34 Analyze methods to expect maximum effect with minimum cost -35 Discovery and contact of potential demanding parties -36 Research & analysis of demanding party (party seeking to implement) -37 Prior-proposal of technology transfer conditions to the parties seeking to receive the technology transfer [Table 9] Major tasks in technology transfer procedure (2) Stage Major Tasks Technology transfer -38 Propose of transfer conditions (Team Sheet) negotiations & -39 Establish negotiation strategy contract -40 Negotiate on technology transfer conditions & details -41 Draw-up & analyze draft contract -42 Different for each depending on the type & form of technology Post management -43 Monitor compliance to the conditions of the contract -44 Actual inspection & report 2. 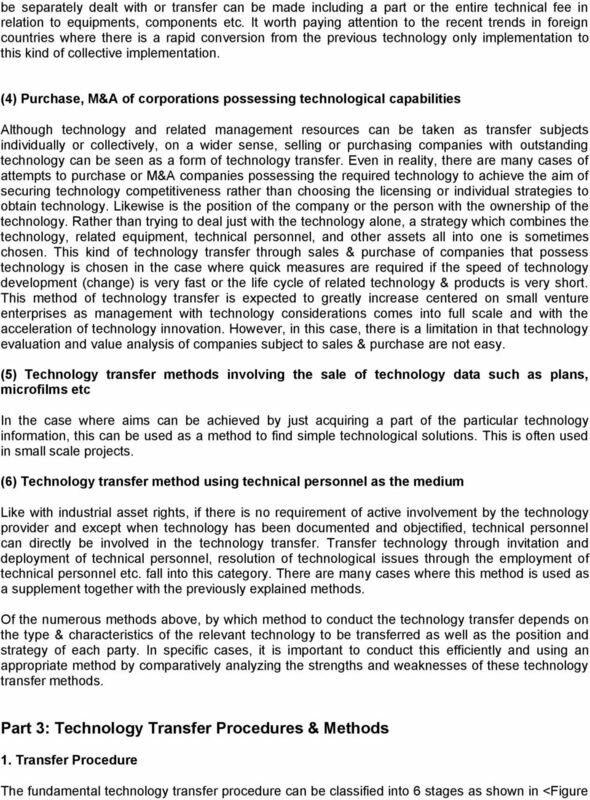 Licensing method in technology transfer The concept & necessity in relation to the licensing method of technology transfer and its differences to sales has already been explained. Here, the types, strengths & weaknesses etc. 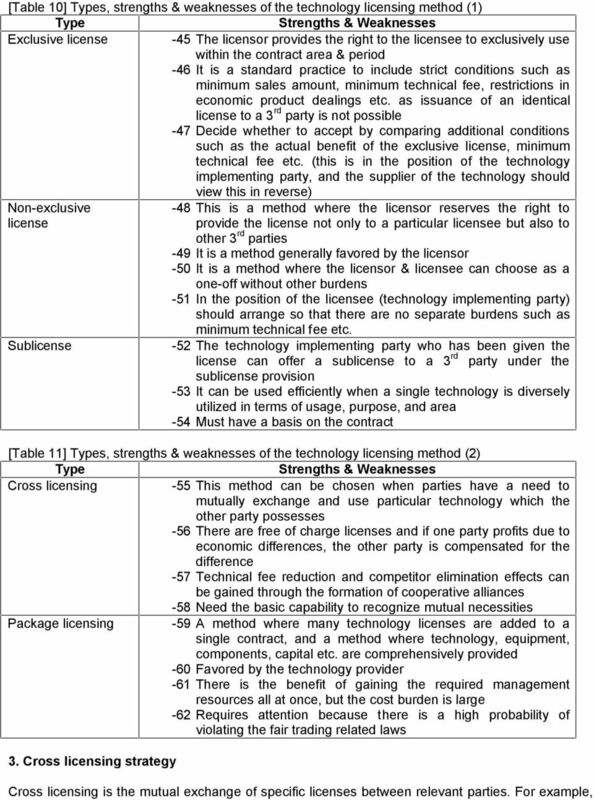 of licensing as shown in <Table 10,11> is concisely summarized to assist in planning, preparing, and analyzing the licensing method of technology transfer. GLOSSARY OF TERMS. Capitalist: A person who owns shares in a business enterprise. IAS - 17 Leases International Accounting Standard No 17 (IAS 17) Leases This revised standard replaces IAS 17 (revised 1997) Leases, and will apply for annual periods beginning on or after January 1, 2005.